My sister and I left for Dorney Park at around 9:50AM. 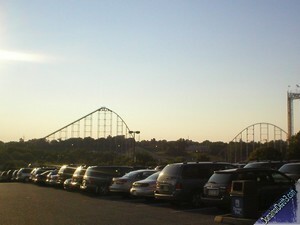 Dorney is an exceptionally easy park to get to from where I live, despite the 1 hour 10 minute travel time. I-78 literally is no more than 1/8 th of a mile away from my house so all I need to do is jump on the westbound lane and drive until exit 54-B. It’s much easier than Six Flags Great Adventure…and the I-78 toll bridge costs less than the NJ Turnpike toll! We got there at about 11:00AM, one full hour after opening. We waited in a maybe 15 minute line to get into the park. We decided to head to the waterpark first and stay there until about 3:00. The waterpark was semi jammed of course, like it always is. We basically did all of the slides except for the Speed Slides, Aquablast, Runaway River, Island Water Works. Aquablast had an awful line so we skipped that, I don’t exactly like that slide anyway. 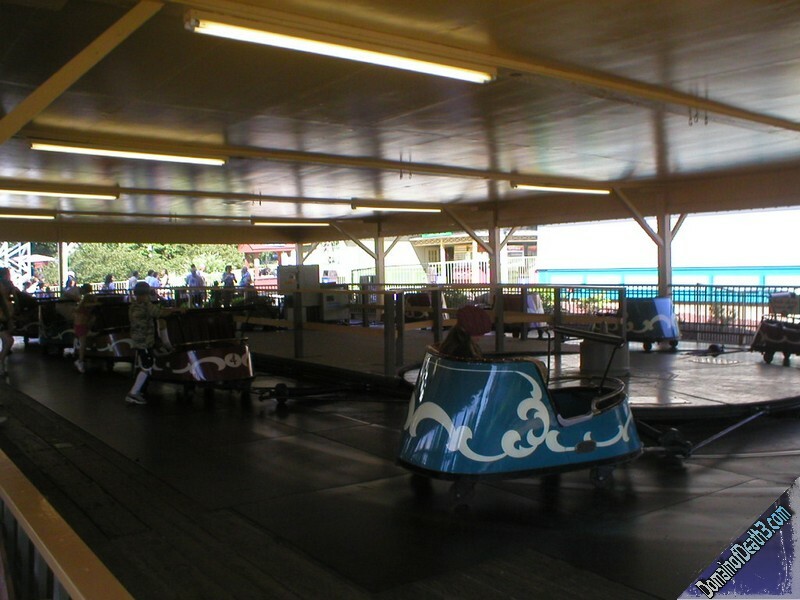 I remember sliding up the wall once on this and seeing the ground like 50 feet below…I’ve been sort of uneasy about the ride ever since! Toward the end of out Wildwater Kingdomstint we decided to go and ride Thunder Canyon while we still had bathing suits on. We got soaked to heck on that ride, but since we had swimsuits on I was hoping to go right under a few waterfalls. The first time I ever went on Thunder Canyon, I went on with park clothes; big mistake! Our first ride was the Whip, which I had never been on before. It was a fun ride I have to say; definitely a classic. The ride time was about average length, any more would have gotten a tad bit boring so it was a good length. 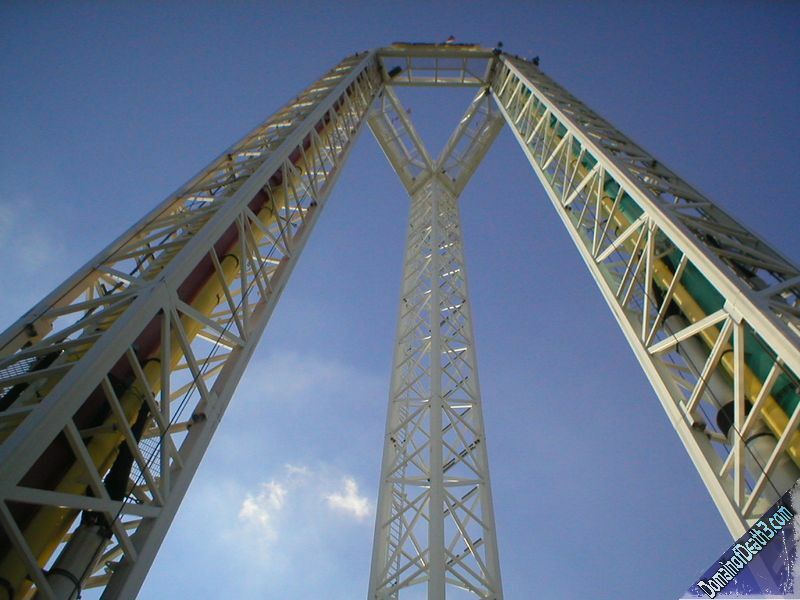 Next I went on the Monster, which is like a supped up Spider/inverted Breakdance. The loading was terribly long, but the ride was a good length so I won’t complain! Next was the Thunderhawk, Dorney’s lone wooden coaster now. I remember Thunderhawk being a lot better than it looks and…it was! Firstly the wait was two train loads; great! The T-hawk looks pretty tame but it has a few airtime hills and that really cool swooping turn with the close supports, it’s also fairly fast through the whole ride until that awful trim brake. Next we went over to Steel Force and were greeted to seeing the train stopped near the bottom of the lift. The chain started up within a few minutes though and we jumped into “line.” The line was a station wait with a 3 train wait…again, great! As always, Steel Force was a ball! 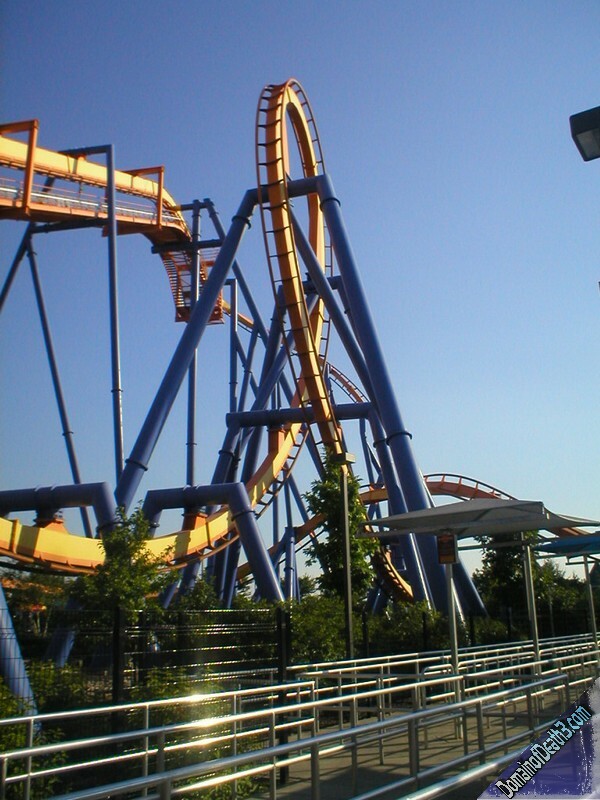 This coaster was the tallest in the East after it opened (205 feet) but was supplanted by Nitro in around 2001 which itself was supplanted in 2005 by Kingda Ka. The first hill was great, the subsequent hill was nice, and the helix was incredible! The helix felt a lot more forceful this time around for some reason. The bunny hops were alright, I didn’t feel anything during them though…then again I have like a lead stomach. People say that, despite common coaster knowledge, that the front cars on Steel Force (and many other Morgan and Arrow made hypercoasters) have better airtime than the back, I’ll have to try that out next time. Next I hopped aboard Revolution; a Chance made ‘Revolution 32’ model. The claw is much larger than the KMG (Fireball) counterpart but the ride was a huge let down. First the ride loads extremely slowly, due to the fact that they test to see if you fit in the seat. Why can’t they do that when the harness goes down? Just look at the light when harnesses are locked and if one is out, then that person can’t ride! Easy! Anyway, the ride was an ok length, but not nearly as forceful or high swinging as the Fireball. It’s the typical big amusement park neutering to a flatride. Next on the list was Laser, the Schwarzkopf portable masterpiece. I waited one train for this ride…again…great! Two kids in front of me, maybe about 11 or so, bragged to each other how fearless they are and that anyone afraid of the Laser was a wuss. I kind of hoped that one of them would black out in the “second loop from hell” after hearing that, but luck jilted me again. The ride was great anyway with its two incredible loops and then the high speed turns which throw you around like a ragdoll. I love how the train roars into the brakes still going at like 50mph. 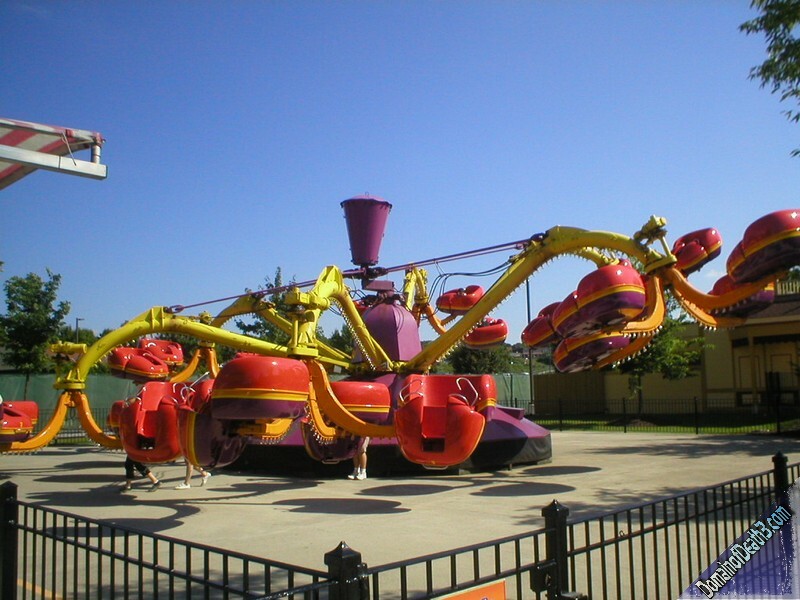 I want a “Doppel Looping” model in my backyard now. Next we headed to Hydra: the Revenge. Hydra was a fun little coaster but it’s almost not even a major ride to me because it’s so small. The wait for this was not even a train load which is absolutely amazing (damn SFGAdv with it’s triple over capacity crowds!!) The first element, the interestingly dubbed “jojo roll”, was fun but kind of silly. I really think that the roll’s sole purpose is to 1. add another inversion to the ride, and 2. get patrons to lose their belongings and money. One of the girls sitting next to us claimed that she lost her sunglasses while going through it. My sister had to hold her sunglasses in mid roll, my glasses (the ones I need to see) rose up a bit but were fine. If I had my other pair of glasses on though…heh…my sister would be driving home then. Hydra was decent though, it had an interesting layout with a few odd inversions. Next we went up to Talon. The wait for Talon was about 5 trainloads, again…GREAT! Talon is my favorite inverted coaster ever so I was expecting another top notch ride. But…it wasn’t top notch…it was above that. The ride seemed much faster than I remember it, the train seemed to just rip through the elements. This coaster just doesn’t let up until you hit the brakes at the very end. My last ride of the day was Hang Time, or better known as Top Spin. This Top Spin used to be much better before they changed it to the SFGAdv cycle. This, like almost all Top Spins, loaded very slowly. The ride made use of the fountains which was nice, but the gondola didn’t even flip once so it basically wasn’t a ‘real’ Top Spin ride experience. Jeez, at least do a few flips! What’s wrong with these big parks? After that we decided to leave, the time was about 7:30pm. The solid hour and 10 minutes of driving with no stops at all wasn’t bad, I-78 eastbound wasn’t congested at all while westbound was much more traffic heavy. Finally, does anyone know why PA has that law that you need to turn your lights on while going through a road construction zone?